Any business milestone is a golden opportunity to foster great workplace relationships through team building, and the End of the Financial Year is no different. Putting your team into fun and motivational situations helps them to connect on a different level, and builds trust, collaboration and an inclusive, positive work environment. Most team bonding events help people build skills in communication, planning and problem solving, resulting in a more efficient, collaborative team! When a sports team wins a major championship, they celebrate and have fun, spurring them on to win again! If your team has managed to meet your targets and finish off the financial year on a high, this celebration is your chance to motivate them to seek the same positive experience every year. We’ve put together a list of unique team building opportunities available in Adelaide this End of Financial Year. Read on to discover your team’s next team building experience! Of course we’re going to start with ourselves! Commonwealth Bank RoofClimb has a range of incredible group and corporate packages available depending on how you want to celebrate your End of Financial Year. 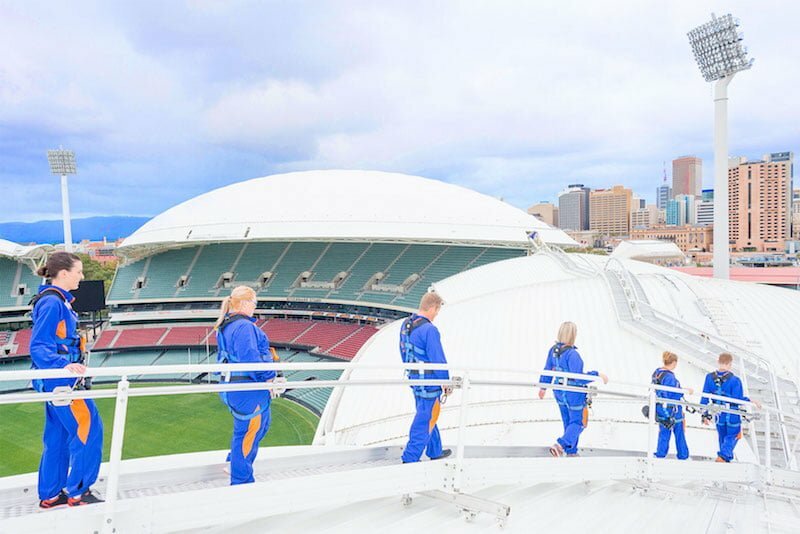 From a climb over the Adelaide Oval roof during the first golden rays at sunrise followed by a delicious breakfast, to watching the sun set with cocktails in the evening, we have an option to suit your team’s needs. Our RoofClimb Leaders will help everyone get into a positive mindset, making sure the whole team enjoys an unforgettable day. There’s something for everyone: physical activity, stunning views, Adelaide history, and of course, the viewing platform. Experiencing the thrill of leaning out 50 metres above the goal square with each other will be sure to bring your team closer together. To find out more about how we can tailor an experience to your needs, visit our corporate and group packages page, email us at enquiries@roofclimb.com.au or send us a message through our enquiry form. Image courtesy of Haunted Horizons’ website. Whether you believe in the paranormal or not, Haunted Horizons Ghost Tours is a unique experience where you take on a ghost hunt! 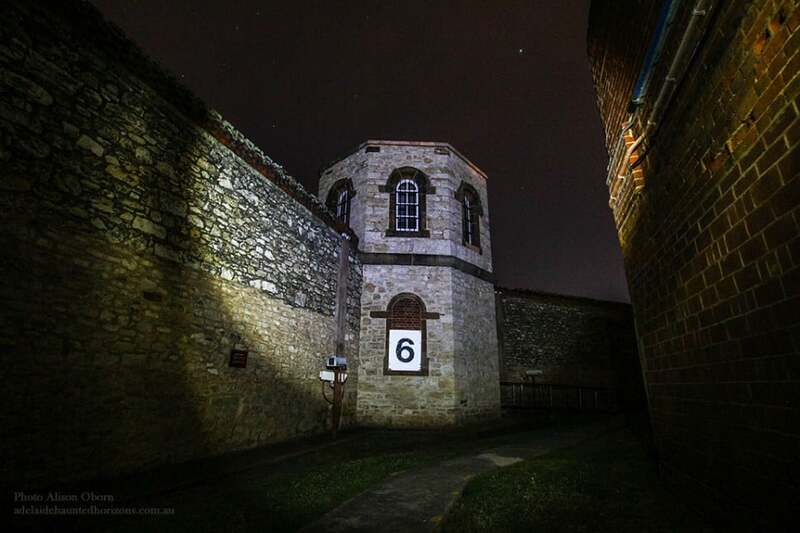 Your team will be lead around some of the most haunted places in South Australia, hearing the grizzly real-life history of some iconic locations around the state. These tours give you a different look at Adelaide’s history, and with multiple awards under their belt, you know you’re getting a high quality tourism experience. Visit their website for more details on the different tours available and pricing information. Image courtesy of Adelaide Zoo website. If your team is constantly sharing pictures of cats or talking about the latest wildlife documentary on TV, this is one team building idea that will win them over. Adelaide Zoo offers a variety of thrilling opportunities to get up close and personal with some of your favourite animals. 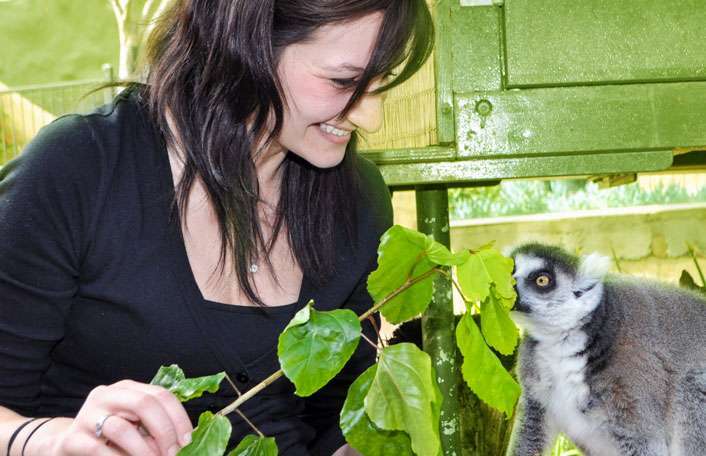 Hand feed the giant pandas, mingle with meerkats, witness the antics of the cheeky lemurs or meet the primates. Joining one of these interactive behind-the-scenes experiences is a great way to get your team together to see another side of the zoo while supporting the incredible conservation work that the Adelaide Zoo achieve. Visit the Adelaide Zoo website to see the huge range of experiences on offer. Image courtesy of This Is Radelaide. Ever feel like your team is forever solving riddles and problems together throughout your work day? Put those problem-solving heads together to figure out the clues and escape the Adventure Rooms! These rooms are a lot of fun and force your team to work together to decipher what all the mysterious objects could mean. You can even rev up their competitive side by pitting two sides against each other in a race to the next room! The Adventure Rooms in Rundle Mall offer a number of rooms and are wheelchair friendly – visit the website for more information about their team building options. Image courtesy of Adelaide Shores website. 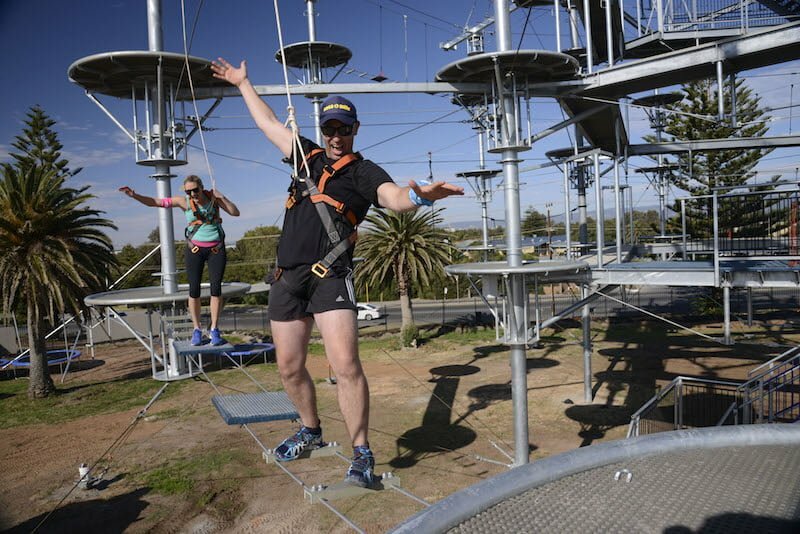 If you’re the kind of team who does fun runs, bootcamps and are often discussing the next challenge you want to tackle, Mega Adventure at West Beach should get everyone’s adrenalin going. With unusual, multi-sensory activities in a sky-high adventure park, your team can explore their limits. Mega Adventure offers a variety of corporate packages designed to help your team tackle problem-solving, get competitive, or just have some fun! Learn more about the options available by visiting their website. Celebrate the End of the Financial Year with a bang! Our team can’t wait to welcome you to an experience that your team will never forget. Send us a message to let us know what sort of experience you’re looking for, and someone will be in touch with you shortly. Otherwise, take a look at the packages and make a recommendation to your HR team for extra brownie points!